Farrar, Straus and Giroux, 9780374106577, 368pp. For Erik Reece, life, at last, was good: he was newly married, gainfully employed, living in a creekside cabin in his beloved Kentucky woods. It sounded, as he describes it, "like a country song with a happy ending." And yet he was still haunted by a sense that the world--or, more specifically, his country--could be better. He couldn't ignore his conviction that, in fact, the good ol' USA was in the midst of great social, environmental, and political crises--that for the first time in our history, we were being swept into a future that had no future. Where did we--here, in the land of Jeffersonian optimism and better tomorrows--go wrong? Rather than despair, Reece turned to those who had dared to imagine radically different futures for America. 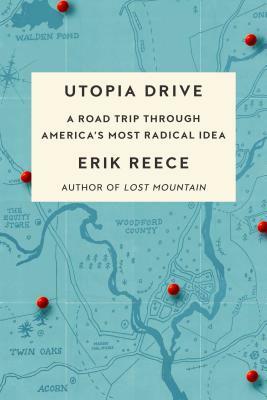 What followed was a giant road trip and research adventure through the sites of America's utopian communities, both historical and contemporary, known and unknown, successful and catastrophic. What he uncovered was not just a series of lost histories and broken visionaries but also a continuing and vital but hidden idealistic tradition in American intellectual history. Utopia Drive is an important and definitive reconstruction of that tradition. It is also, perhaps, a new framework to help us find a genuinely sustainable way forward. Erik Reece is the author of Lost Mountain: A Year in the Vanishing Wilderness; Radical Strip Mining and the Devastation of Appalachia; and An American Gospel: On Family, History, and the Kingdom of God. He has also written for Harper’s Magazine, The Nation, and Orion Magazine. He is currently the writer in residence at the University of Kentucky in Lexington, where he teaches environmental journalism, writing, and literature.